I have been looking forward to this comic for a long time now. I will admit, I had sort of lost interest in STAR WARS for a while, but with REBELS and all the hype for THE FORCE AWAKENS, I have been in a STAR WARS mood lately. Thankfully, I don't have as much free time as I did when THE PHANTOM MENACE came out. My wife and siblings spent way too much time driving me all over the place to find STAR WARS toys and cup toppers from Pizza Hut, Taco Bell, and Kentucky Fried Chicken. Thanks, Gina, Patti, and Chris. You are terrible enablers. Instead of toys, this time I am acting out my obsession with comics and books. I have bought every STAR WARS comic Marvel has put out so far, and slowly I'm working my way through the novels that have come out the last few years that Disney declared official canon. And SHATTERED EMPIRE sounded like it was going to be a real good one. 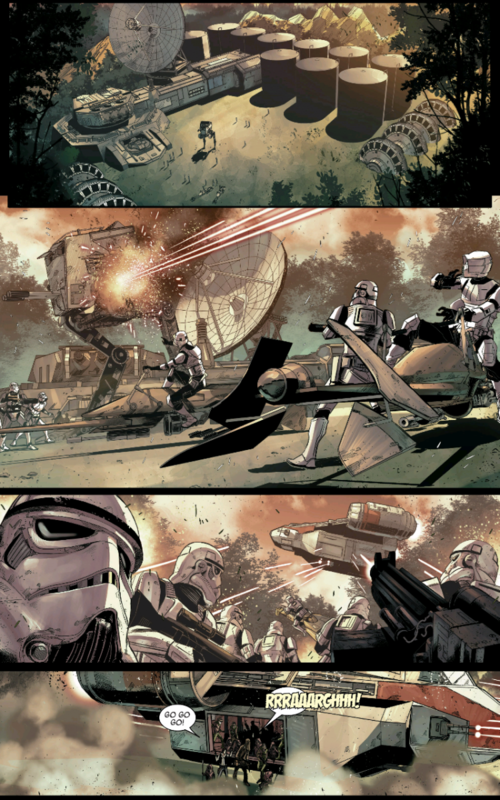 SHATTERED EMPIRE takes place during the Battle of Endor. We see the battle through the eyes of a pilot named Shara Bey. Her husband Kes Dameron was a part of Han Solo's strikeforce on Endor's surface, a Specforce Pathfinder. Shara is worried that Kes was killed, but she finds him alive, and they spend the night together. 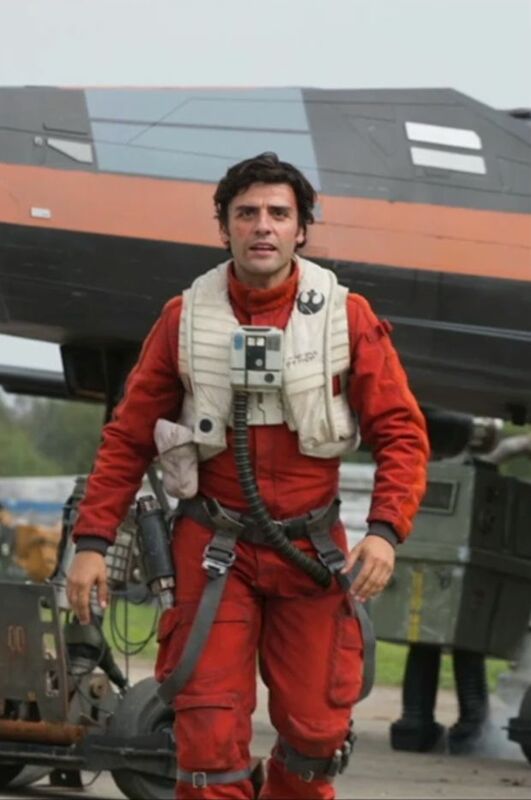 It's safe to assume this is how Poe Dameron (Oscar Isaac's character in THE FORCE AWAKENS) was conceived. In the morning, Kes is tasked with helping take down an Imperial base on the far side of Endor. The rebels storm the base. They manage to seize lots of data and communication traffic. With a grim frown, Han says, "It's not over yet." And that is where this issue comes to an abrupt end. This is a tricky review to write. I say this all the time, the hardest reviews to write are for comics that I don't love or hate. This was not a bad comic at all. The characters were well-written and the story worked fine. There was some humor that felt perfectly in tone for STAR WARS. But at the same time, this issue just wasn't all that special. I have seen RETURN OF THE JEDI many times. I love the Battle of Endor, and the movie did an excellent job showing the scope of that battle. Seeing it replayed through the eyes of one pilot just felt kind of limiting. And the rest of the story just plays out in the most generic way possible. Rucka is a great writer, and this sort of feels beneath his normal talent. I don't know. Maybe I am just being too hard here. I did like the action sequence with the rebels taking the remaining Imperial base on Endor, but it just didn't feel all that high stakes. Only real surprise is that Kes survived the issue. It seems heavily foreshadowing towards Kes not making it out of this mini-series alive. It is possible that neither Shara or Kes make it out alive. The novel, MOVING TARGET, seemed to suggest that Leia was really close to Poe. Maybe she ends up adopting him after his parents died. One thing I did like about this book unequivocally was the art. The action sequences looked great, and the characters were all beautifully drawn. I especially liked the depiction of the Battle of Endor. This was not a particularly bad comic, I just think my expectations were a little too high. I have said this a lot about the various JOURNEY TO THE FORCE AWAKENS books and comics. None of them have been bad, but none of them have quite been what I hoped for. Maybe my expectations were just unrealistic, but I was really hoping for a lot more hints about THE FORCE AWAKENS, or at least more of the time period between RETURN OF THE JEDI and THE FORCE AWAKENS. Hopefully, THE FORCE AWAKENS will be a lot more satisfying than the stories leading into it. Nothing particularly unique about this story. 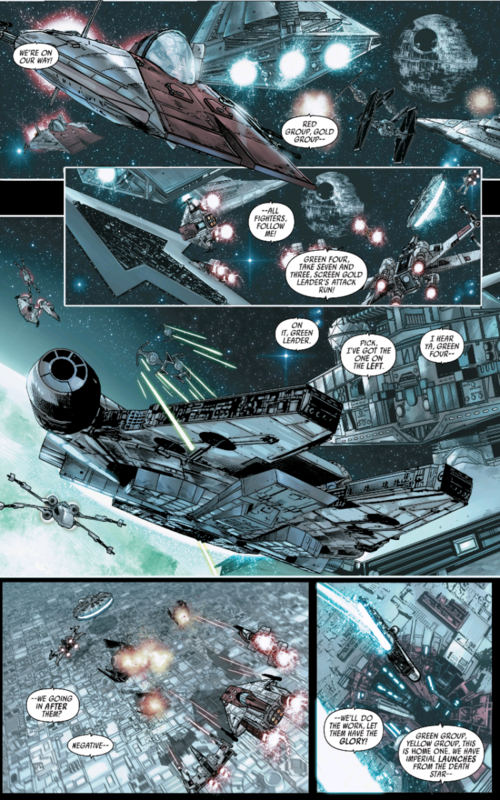 Some hints at the events leading to Force Awakens, but not enough to justify the need for this comic. Is it worth your $3.99? It was well written and drawn, but not quite as good as the other STAR WARS comics that Marvel has been putting out. I don't regret buying this comic, but I would still have a hard time recommending this comic to others.